The ACEN accredits nursing programs located outside the United States and its territories and is seeking international peer evaluators to conduct accreditation site visits to international nursing programs seeking initial or continuing accreditation with the ACEN. Peer evaluators make recommendations to the ACEN Board of Commissioners. Peer evaluators are knowledgeable about common, contemporary, and best practices within the various nursing program types, appropriate curricula, and conventions and current trends in healthcare, nursing education, and/or nursing practice. 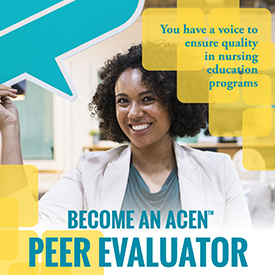 The ACEN encourages individuals from outside the United States to self-nominate or nominate nurse educators and nurse clinicians/practitioners to serve as an ACEN peer evaluator to international nursing programs. Please fax your nomination to +1 (404) 975-5020 (ATTN: Peer Evaluator) or send as an email attachment to peer_evaluator@acenursing.org. After ACEN staff review of submitted materials, selected individuals will be invited to become an ACEN peer evaluator. The selected individual must complete the peer evaluator training offered by the ACEN. This peer evaluator training is offered in an asynchronous online format, which is accessible 24/7. Peer evaluators that remain eligible may serve for an indefinite period of time if they receive ongoing positive site visit performance evaluations and remain current with the ACEN accreditation processes and practices. Currently holds a full-time faculty or administrative appointment in an ACEN-accredited program. Previously held a full-time faculty or administrative appointment in an ACEN-accredited program and is retired for no more than two (2) years from this position. Previously held a full-time faculty or administrative appointment in an ACEN-accredited program and then held a part-time faculty or administrative appointment in an ACEN-accredited program and is retired for no more than two (2) years from the part-time position.